60 years since the launch of Sputnik, satellites have become the invisible infrastructure that powers our modern world. But it wasn't until the 1991 Gulf War that the public came to recognize the transformative power of GPS and communications satellites. A still from a sequence illustrating geostationary satellites and their ability to blanket the earth in communications. GPS played a major role in the outcome of Operation Desert Storm, hence the title of the episode "The First Space War." GPS was first envisioned as a utility for precision targeting in warfare. "No matter where you are on Earth, from the top of Mount Everest to the middle of the ocean, you're connected." 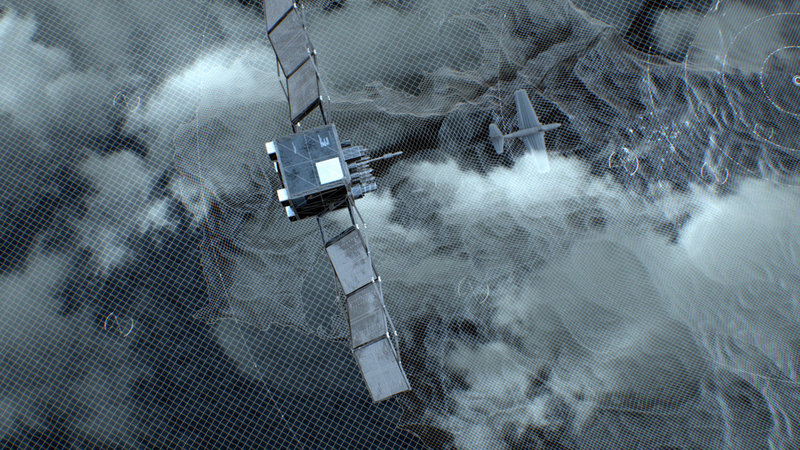 An effects sequence illustrating the proliferation of satellites surrounding the planet Earth. I had the unique opportunity to team up with the filmmakers at The Documentary Group, tasked with crafting all of the effects and motion graphics shots for the second season of The Age of Aerospace for Discovery Networks. For this episode, I worked closely with the producer, director and expert team to take their story elements and communicate them in what needed to be clear and simple visual ideas. In total, this episode contains nearly 8 minutes of effects and graphics shots which I was pleased to design and animate.